Former French Emperor Napoleon Bonaparte arrived at St. Helena, his final place of exile, in October 1815. What were his first impressions of the island, and what did the inhabitants think of him? The morning was pleasant, and the breeze steady: at dawn we were sufficiently near to behold the black peak of St. Helena. Between eight and nine, we were close under the Sugar-Loaf Hill. The whole of the French party had quitted their cabins, with the exception of Napoleon, and taken their respective stations…. We did not see Napoleon until the ship had anchored in front of the Town. About eleven he made his appearance. He ascended the poop, and there stood, examining with his little glass the numerous cannon which bristled in his view…. Count Emmanuel de Las Cases also remarked on Napoleon’s lack of expression. Another of Napoleon’s companions, General Gaspard Gourgaud, noted in his diary for October 15 that Napoleon was not entirely complacent at the prospect of his new abode. Rear Admiral George Cockburn, the commander of HMS Northumberland, and Brigadier General George Bingham, commander of the troops sent to guard Napoleon, went ashore to look for a dwelling large enough to temporarily accommodate Napoleon and his 26 companions. They settled on a house belonging to Henry Porteous, superintendent of the East India Company gardens. Las Cases described the scene on the Northumberland. 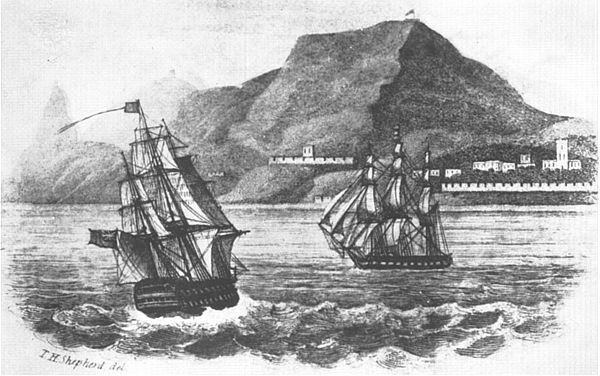 Because of the slowness of communications, the inhabitants of St. Helena – then numbering some 5,000, including over 1,000 slaves – had not heard of Napoleon’s escape from Elba, or of the Battle of Waterloo, let alone of the choice of their island to house the world’s most famous conqueror, until a few days previous. That news came via the Havannah, Icarus and Ferret, ships that had left Plymouth Harbour with the Northumberland, but had arrived ahead of it. Betsy Balcombe, the then 13-year-old daughter of an East India Company superintendent, described the sensation this produced. For two days St. Helena residents gathered at the wharf, waiting to see Napoleon. Each night they returned home disappointed. Finally, on the 17th, the “ogre” appeared. Betsy described the moment. Napoleon did not like the Porteous house, in which the Duke of Wellington had stayed on an earlier voyage from India (the building was destroyed by a fire in 1862). On October 18, Napoleon went with Admiral Cockburn to examine Longwood House, which had been selected as his long-term residence. He was not particularly enchanted with it. In any case, the house needed to be renovated and enlarged before it could accommodate Napoleon and his retinue. On the way there, he noticed a small house that struck him as charming. This was the Briars, home of Betsy Balcombe and her family. Napoleon stopped there on his return, and asked if he could stay there instead of returning to Jamestown. The Balcombes graciously agreed, so Napoleon lived in a pavilion at the Briars until December 10, 1815, when he moved to Longwood. He remained there until his death on May 5, 1821. If you’re curious about what might have happened if Napoleon had escaped from St. Helena, read Napoleon in America. William Warden, Letters Written on Board His Majesty’s Ship the Northumberland and at Saint Helena (London, 1816), pp. 213-215, 101. Louis-Joseph Marchand (Proctor Jones, ed. ), In Napoleon’s Shadow (San Francisco, 1998), p. 339. Emmanuel de Las Cases, Memoirs of the life, exile, and conversations of the Emperor Napoleon, Vol. 1, (New York, 1855), pp. 154-155. Gaspard Gourgaud, Talks of Napoleon at St. Helena, translated by Elizabeth Wormeley Latimer, 2nd edition (Chicago, 1904), p. 33. John R. Glover, Taking Napoleon to St. Helena, From the Century Illustrated Monthly Magazine of October and November, 1893, p. 90. Memoirs of the life, exile, and conversations of the Emperor Napoleon, Vol. 1, p. 156. Lucia Elizabeth Balcombe Abell, Recollections of the Emperor Napoleon, during the First Three Years of His Captivity on the Island of St. Helena (London, 1844), pp. 10-13. In Napoleon’s Shadow, p. 341.
lovely article – says it all! Lovely insight to the moment of exile. I managed to experience Waterloo 200 in Belgium. Cannot believe how satisfying it was for me to be at the re enactment…this piece has added to those memories. Thank you. My pleasure, Steve. Glad you enjoyed the article. I’ve enjoyed watching videos of the re-enactment – it must have been wonderful to be there. Excellent summary with some interesting quotes. For the curious, it appears that the Icarus reached St. Helena on 10th October and that Captain D. was a Captain Devon. It seems strange that Las Cases quotes Napoleon as landing on the 16th when it seems certain that it wasn’t till the late evening of the 17th as detailed in the article. Thanks, Gary. It’s good to know when the Icarus arrived, and who Captain D. was. I must admit I puzzled over Napoleon’s disembarkation date, as several sources seem to have picked up on Las Cases. In the end, I thought there was more credible evidence in favour of the 17th. I’m glad to have your corroboration of that. He regretted not having stayed in Egypt and become the emperor of the Orient. Did he ever think of anyone but himself, and just perhaps his immediate family? Perhaps you know, Shannon. He occasionally thought of his soldiers, but you’re right, Geoffrey, Napoleon’s primary consideration was himself, and (especially once he was on St. Helena) how he would be regarded by posterity. Napoleon arrived at St. Helena October 15, 1815 and remained on the board of NORTHUMBERLAND ship till 7 p.m. of October 16. After 7p.m. he left the boat to land on the island. Sources differ as to whether Napoleon went ashore on October 16th or October 17th. I have used October 17th, which is the date given by Marchand and Warden, and the date celebrated by the residents of St. Helena as the anniversary of Napoleon setting foot on the island (e.g. https://whatthesaintsdidnext.com/2015/10/18/saint-helena-remembers-napoleon-bonaparte-200-years-on/; http://sainthelenaisland.info/napoleon.htm). Very interesting article. Family history is that my G.G.grandfather, John Brill, was the first mate on ship that took Napoleon to St Helena. He named his daughter Helena. Later he settled in Ottawa valley. Thanks, Lois. I like the connection to Canada. Hi Lois , my name is Marcus Brill and I am a great grandson of Richard Brill and he was one of John Brill’s sons. It would be great if we could talk. Lovely to hear from you, Marcus. I’ll put you in touch with Lois. 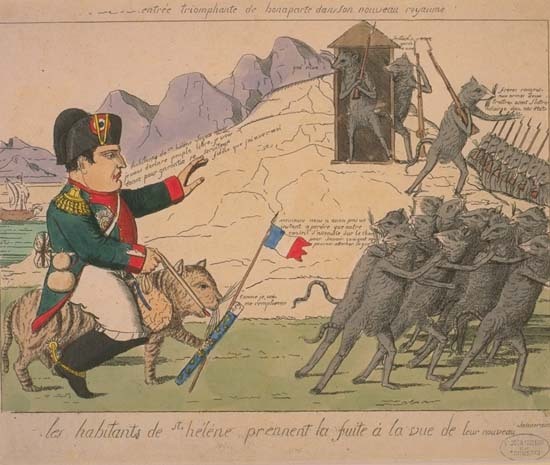 Lovely account of Napoleon’s arrival at St. Helena. I’m interested in the event for a personal reason. Could you please help me with a question? My great grandfather’s grandfather, a Lloyd, was said to have”guarded” Napoleon while at St. Helena. I know it’s not much to go on. Is there any way I can find out more? Thanks, Nigel. It’s lovely to hear from you. According to A St. Helena Who’s Who, or a Directory of the Island During the Captivity of Napoleon by Arnold Chaplin (1914), Lieutenant Vaughan Lloyd served on HMS Conqueror, the 74-gun flagship of Admiral Robert J. Plampin, which arrived at St. Helena on June 29, 1817, and left St. Helena on July 20, 1820 (see p. 39 https://archive.org/stream/asthelenawhoswho00chapiala#page/38/mode/2up/search/lloyd). I hope that helps. Hi, my husbands 3xgreat grandfather served on St.Helena with the 66th Foot. His name was Terrence Connigal, any info please? Hi Margaret, Though I don’t see Terrence Connigal’s name, there is information about the 66th Regiment in A St. Helena Who’s Who by Arnold Chaplin (1914), a directory of people on the island during Napoleon’s captivity. It’s available for free on the Internet Archive: https://archive.org/details/asthelenawhoswho00chapiala. Good luck with your search. Hello, My great grandmother was from St. Helena and talked to my grandfather of feeding or cooking for Napoleon. She later moved to Martha’s Vinyard do you have any record of Abigail Smith? Hi Sally, I don’t see any mention of Abigail Smith in A St. Helena Who’s Who, and I haven’t come across her name in other sources. Hi, a relation of mine was in charge of, I think, the Northumberland and Napoleon wrote a letter, thanking him for looking after him well. Unfortunately the letter was destroyed in a fire in Devon about fifty years ago. I think my relation may have been Admiral Sir George Cockburn. Would be very interested to hear any information on this. My Grandfather was Peter Morey and this was the side of my family who was related to the Admiral of the Northumberland. Many thanks. Too bad about that letter, Catharine. Unfortunately, I don’t know anything about Admiral Cockburn’s descendants. Perhaps someone reading this post can comment. If you haven’t already read it, you might enjoy Admiral Cockburn’s account of the journey on the Northumberland, published as Buonaparte’s Voyage to St. Helena (1833) and available for free on the Internet Archive: https://archive.org/details/buonapartesvoya00cockgoog/page/n4. interested may go on the adventure of looking it all up in the more than abundant literature on Napoleon! Its very revealing and may surprise a lot of prejudiced people! I think that’s a good idea, Irene, for people to read the literature about Napoleon and draw their own conclusions. Napoleon was excessively provoked at the eagerness of the crowd to get a peep at him, more particularly as he was received in silence though with respect.